JustRite Papercraft Clear Stamps 4"X6"
JustRite-Clear Stamps. Clear stamps make it easy to get the image exactly how and where you want it. 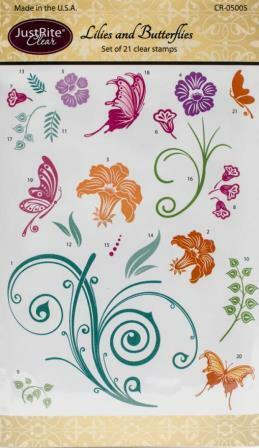 This package contains Lilies And Butterflies: a set of twenty-one clear stamps on one 6x4 inch backing sheet.